It is the responsibility of the parent to provide the child's immunization record. Please make sure your child eats something prior to receiving vaccinations. Vaccines available for those with Medicaid, those who are uninsured, or under insured (vaccines NOT covered by insurance). Additionally, we have the ability to bill (most) insurance. 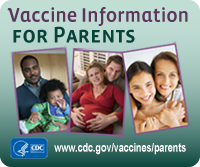 All recommended childhood vaccines are offered. Vaccines are offered to ages 1 month thru 18 years. All children under 18 years of age are required to have parent/guardian present. If someone else brings your child, we require a parent to fill out, sign the forms and give written permission for whoever bring the child for immunizations. Childhood vaccinations are held on the Basement (B) level of the Administration Building. Please contact the Public Heath Nurses with questions or to schedule an appointment.